Baking Class, Cooking Class and Enjoying the final meal. A few weeks ago, Zoe-Pascale and I took a baking class at the Biologique Boulangerie in town. A large bakery that has an enormous clean space to work in with glass windows to watch through as the bakers are working. This time we got to be the bakers with aprons, hats and all the proper tools and ingredients. The baker taught us how to weigh, kneed and place the bread in baskets or on between baking sheets for rising and then shape them into baguettes and other shapes. Zoe-Pascale formed a few hearts (see picture) her favorite shape today as well a a flower and the baker did a turtle. 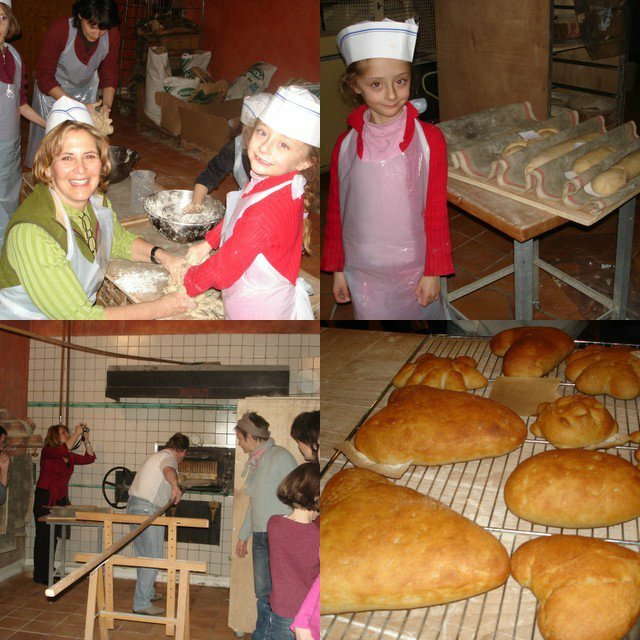 On the bottom left hand picture you can see the large oven which holds 250 loaves of bread at one time. The oven is shaped like a flat wheel which turns by hand with the wheel on the wall as more bread is put in the oven and taken out. The second half of the class was cooking a saucisse meal with Frank, the butcher. A mixture of onions, tomatoes, olives and hot peppers are sauteed and combined with the boiled saucisse (sausage). The hot peppers give it a completely unique flavor and a zest. On the side was a cucumber salad and salsa type dish to eat with the meal. 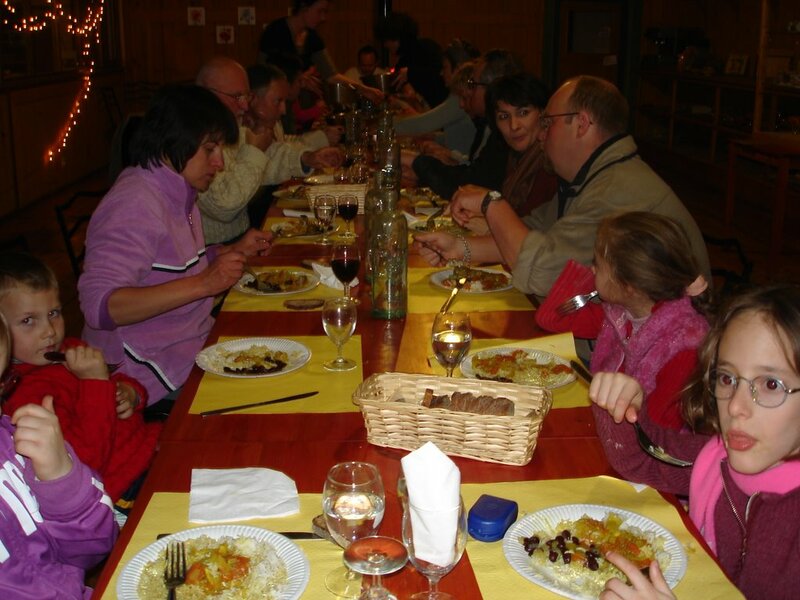 All the class and their partners returned for dinner and enjoyed the fabulous dishes. Later that week I tried the Saucisse dish and had rave reviews from Zoe-Pascale and Jean. I talked to the butcher and told him I couldn't find the very tiny pepper so he reached into his walk in refrigerator and wrapped me up a dozen to freeze for when I needed to use them. A week later I made the dish again, but was a bit generous with the peppers and Zoe-Pascale and Jean drank 2 bottles of water with this very zesty dish. Next time beware that the tiny peppers are 10x as hot and it is important to remove the seeds.